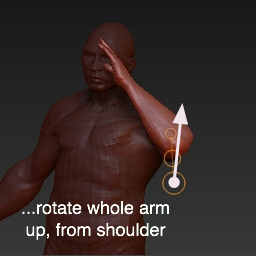 With Rotate pressed on the shelf, press and hold CTRL then click on the pectorial muscle of the solder and drag towards the deltoid (shoulder muscle) to create a topological mask that isolates the arm. Release CTRL. Click on the shoulder and drag downwards towards the hand. This will create an action line. 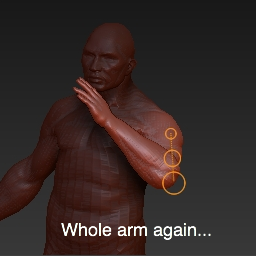 Click and drag the end point to pose the arm. 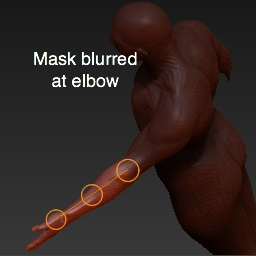 Redraw the topological mask for the forearm. To do this press and hold CTRL then click on the bicep of the soldier and drag towards the forearm. 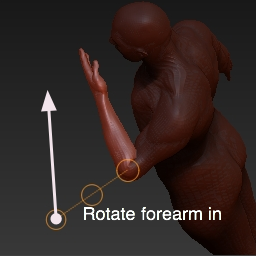 Draw another action line, click on the end point and pose the forearm. 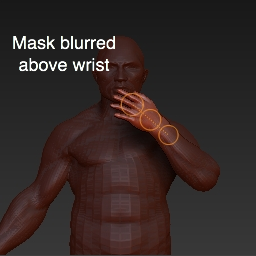 Draw another mask for the wrist area. 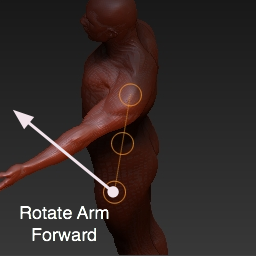 Draw another action line and move it inside of the wrist so that the hand will rotate from the center of the wrist. Click on the center dot to rotate the hand around the action line. Clicking on the end points moves the model on a fulcrum. 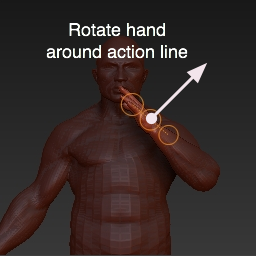 Clicking on the center point rotates the model around the axis of the action line. Let’s draw another mask for the arm so we can rotate the entire arm upwards towards the head. Click and drag on the end point to raise the entire arm. 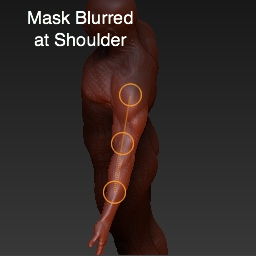 Transpose also has a mode that provides, if needed, a more accurate model of how skin folds on and displaces itself. 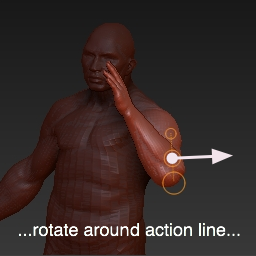 Position the action line to represent the bone above where you want to bend your sculpt. Press and Hold Alt then click and drag left or right on the end of the action line. 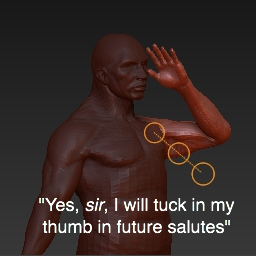 Note: you do not need to mask your model for this to work. It will move all parts of the model below the bottom action line.